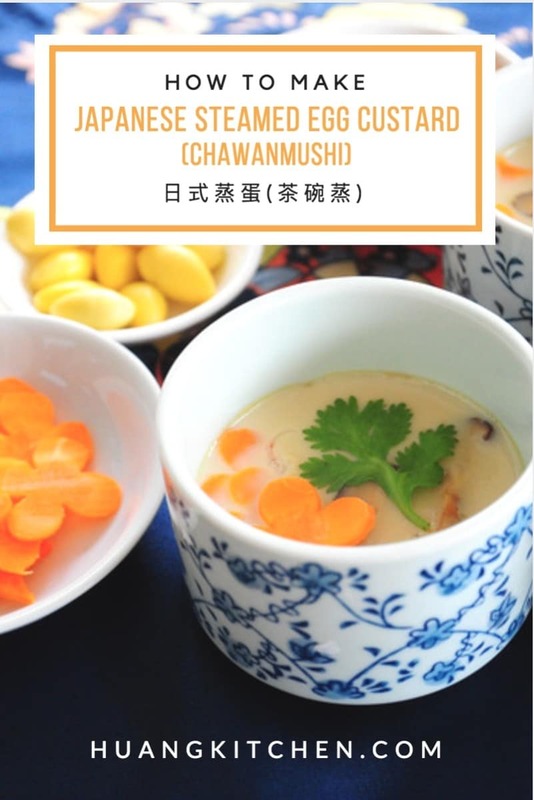 Chawanmushi which literally means “steamed in a tea cup/ bowl” is a popular Japanese steamed savoury egg custard dish. Unlike many other custards, this can be eaten as a dish in a meal. It is usually served as an appetizer in any traditional Japanese meal. This silky smooth egg custard consists of an egg mixture flavoured with dashi which is a cooking stock used in most Japanese cuisine. For this recipe, I have chosen a simple version of the savoury egg custard with only vegetarian filling. 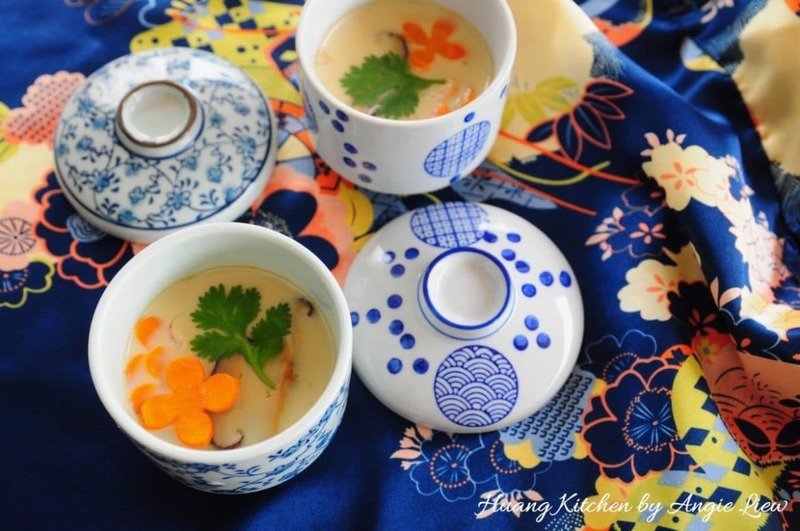 Chawanmushi is quite similar to that of Chinese steam eggs, but the fillings may differ. The Chinese version of steamed egg is a lot simpler and is usually served in a steaming bowl with steamed rice. Chawanmushi on the other hand is delicately flavoured with dashi stock and embedded with ingredients at the bottom of the egg custard. Also, what’s so special is, this silky smooth egg custard is usually served in small Japanese tea cups for an authentic chawanmushi experience. 4dried shiitake mushroomssoaked till soft and drained well. 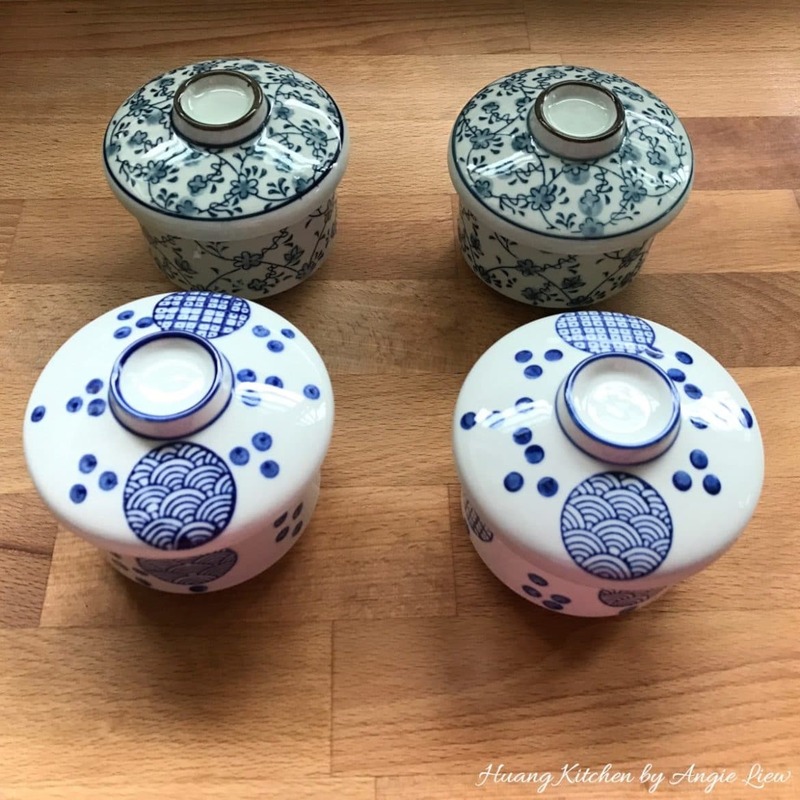 First, have ready 4 small steaming cups with lids. 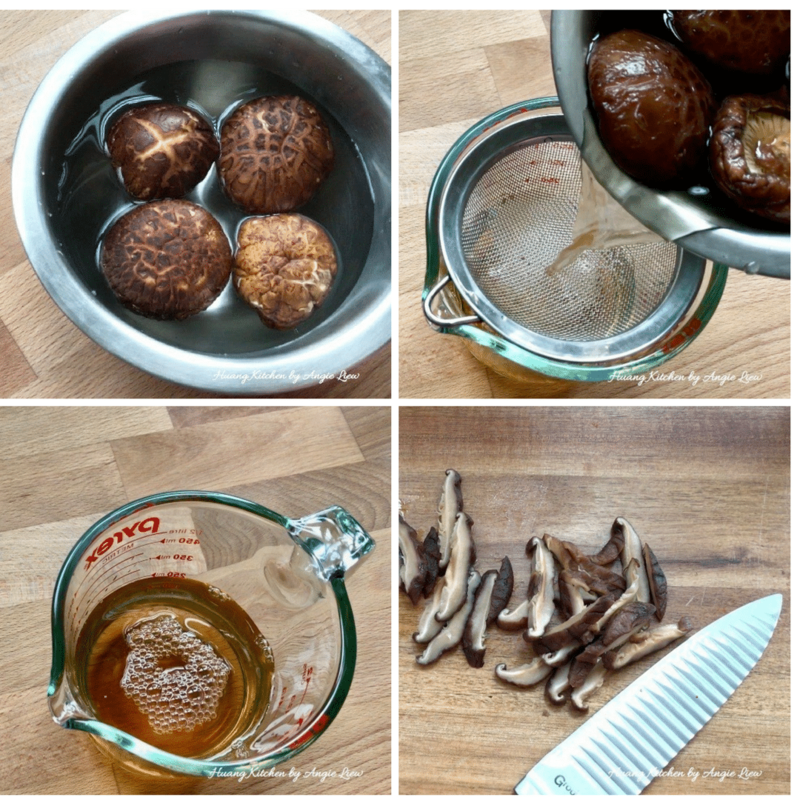 Then soaked dried shiitake mushrooms in water till soft. Drain well the softened mushroom and slice into thin pieces. Retain the mushroom liquid for later use. 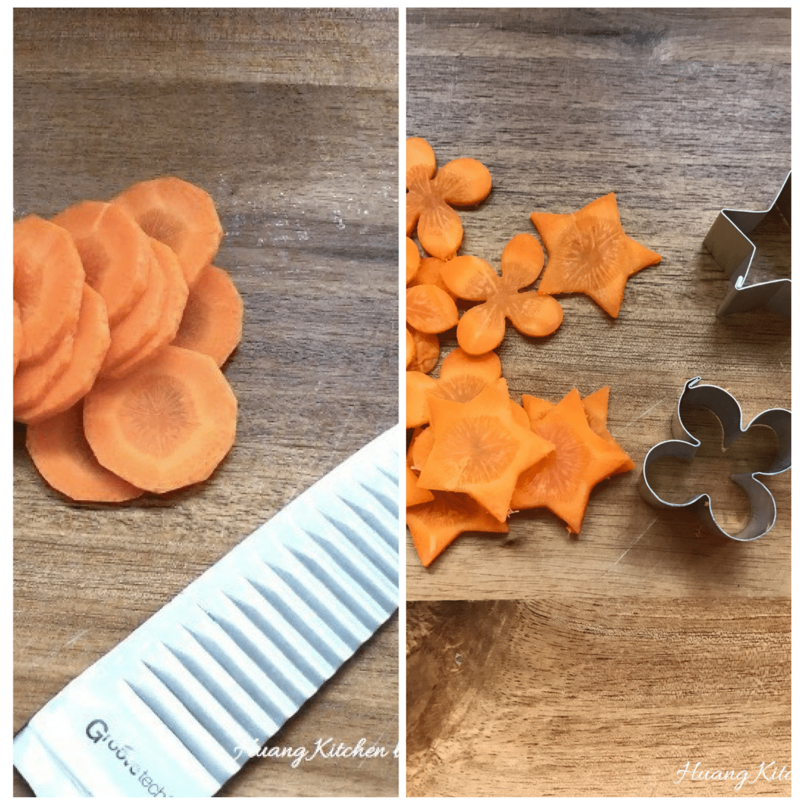 Cut carrot into thin slices and shape into florets using a vegetable cutter. 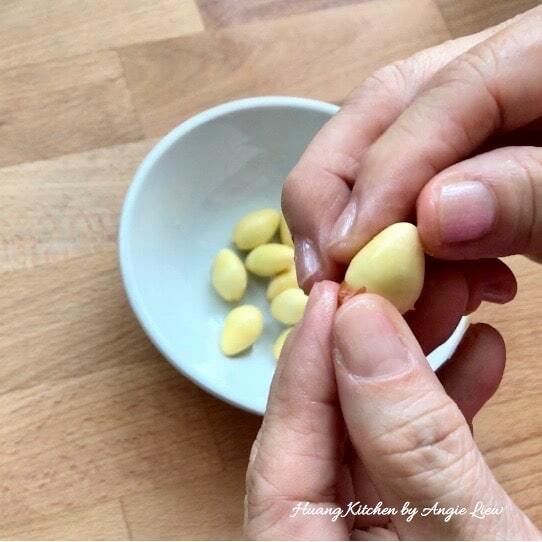 Remove shell and peel off skin of gingko nuts. 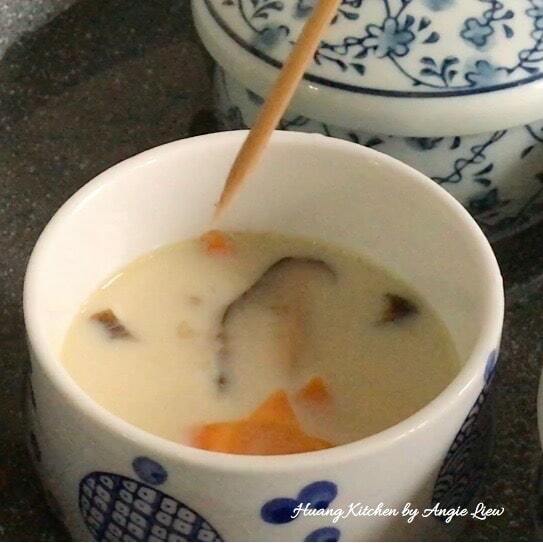 Next, prepare dashi stock by adding one packet of dashi powder into a cup of mushroom liquid. Over low heat, stir to dissolve the dashi powder. Then leave aside to cool. Then whisk two eggs in a bowl. Beat gently so that the eggs do not froth up too much. Add in the seasonings and dashi stock. Stir to mix well. Then gently strain the egg mixture through sieve into a measuring cup for easier pouring. Next, prepare the steamer. First, place the 4 empty cups into the steaming pot. Then pour water till it covers half way up the exterior of the cups. Next, remove the cups, cover the pot and boil the water in the pot. 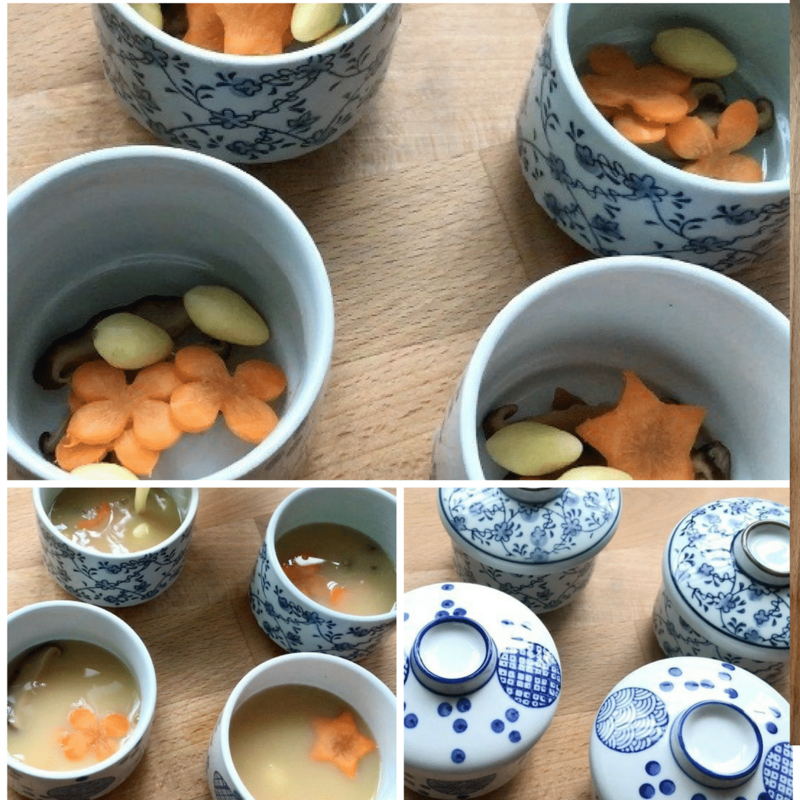 While waiting for the water to boil, divide equally the cut mushrooms, carrot and peeled gingko into the 4 cups. Then gently pour the strained egg mixture equally into the cups and place on the lids. And we're ready to steam the custard! 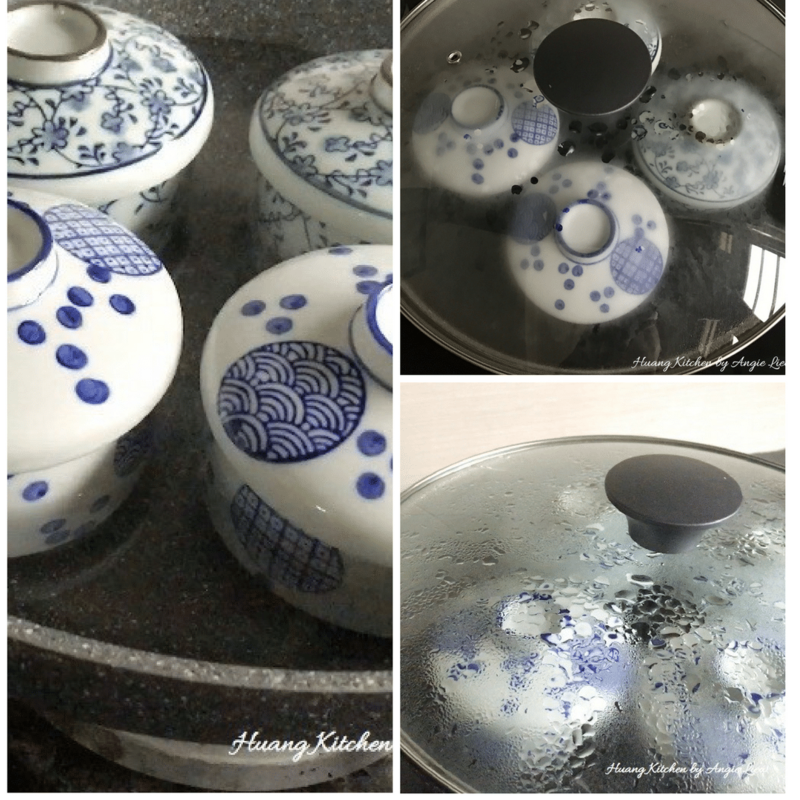 Once the water in steamer starts to boil, reduce heat to low. 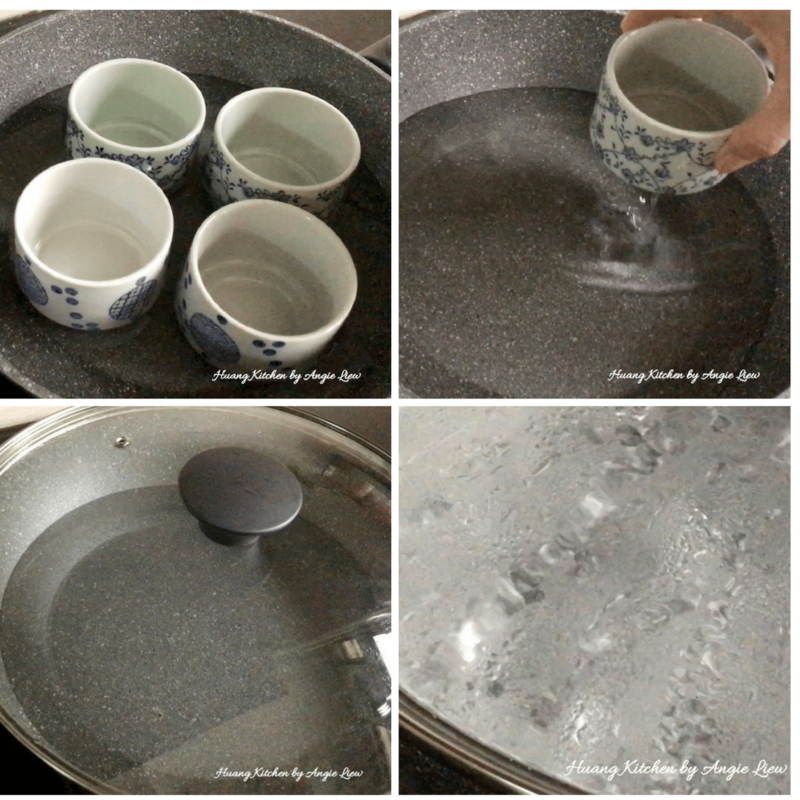 Place the filled covered cups gently into the water and cover the pot. Steam for 15 to 20 minutes. Check for doneness by inserting a wooden skewer into the custard and it should come out clean. Use the freshest eggs possible to ensure the egg custard comes out aromatic. 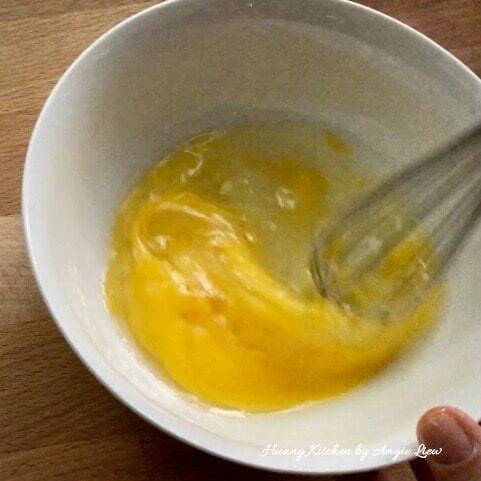 Straining the egg mixture ensures the egg custard is free of bubbles and is smooth. You can cover the cups with aluminium foil if a lid cover is not available. 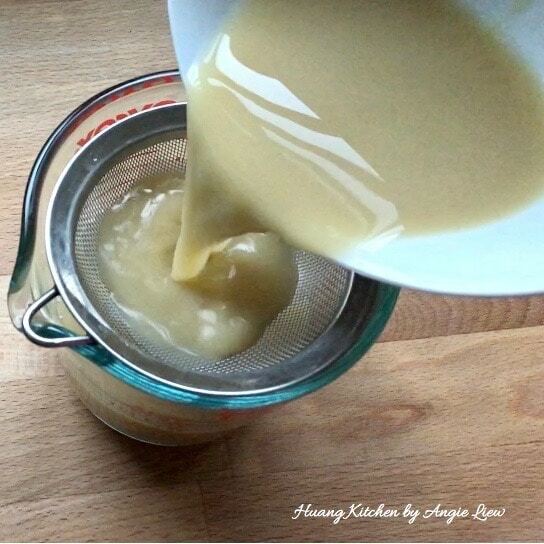 Steaming time for custard without chicken meat is about 15 – 20 minutes, with chicken meat is about 25 – 30 minutes. Use the LOWEST heat possible to steam the egg custard as this will ensure a smooth and flawless top and egg texture.